Platform Size 2.4" x 2.4"
Scale Size 4.7" x 2.8" x 0.6"
Bright Backlit Display This digital scale has a fancy blue, backlit display to help ya see your weight readings, even in dim lighting. Easy Calibration This scale comes factory calibrated and ready to use. Just in case ya need to calibrate it, the LC-300 comes with easy to follow calibration instructions. You'll just need to pick up a 300 gram calibration weight to get the job done. The Protective Cover Does Double Duty! This pocket size scale's hard protective cover is great for keeping your scale safe when ya aren't using it...and it doubles as a nice expansion tray, increasing the area ya have to weigh your stuff on. Since it has edges, you can weigh all kinds of things that would normally fall right off the platform. Tare Feature The tare button on the front of this digital jewelry scale can be pressed to "zero out" the weight on the scale. You can then add more weight, and the display will only show the weight of the items you're adding. This sure is useful when ya want to use the cover as an expansion tray to weigh your things, or if ya want to get separate weights of multiple items. Man, This Thing Is Small! You won't have to worry about this scale taking up space. It's just under 5 inches long, and just 0.6" thick! You can take this scale pretty much anywhere ya want...stick it in a pack, purse, or in your shirt pocket. It Remembers The Last Unit Ya Used If your application needs weights in the same unit of measurement, (like ounces for instance), it can be a real pain if your scale always turns on ready to weigh in grams. It's a good thing the ProScale LC 300 turns on displaying the unit of measurement you were using when ya turned it off. Auto-Off Feature If ya have ever had the batteries in something run out because you forgot to turn it off, you'll realize what a blessing this feature is. The LC-300 will automatically turn off after a few moments of inactivity, saving battery power and money. 5 YEAR MANUFACTURER'S WARRANTY! If ya have a problem with this scale, just send it to ProScale's warranty center in Phoenix, Arizona. They'll fix or replace your scale and send it on its way back to ya within a week of receiving it. You should expect your replacement to arrive in about two to three weeks from the day you send the original off. Keep in mind that sometimes ProScale runs out of stock, which can cause a delay in the warranty replacement process. Love it! Perfect size, easy to carry with me and right price! Excellent service! Used it to weigh some coins and it did exactly what it is suppose to do. Good investment. Works well and suits my needs. Thank you. Perfect small mobile scales for someone who is not always in the office when estimates, sales or purchases need to be made away from business central. I am very pleased with my purchase and would recommend them. 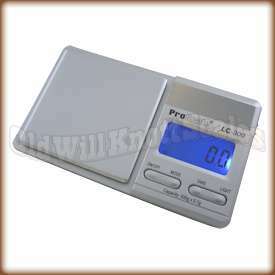 Dead on accurate when compared with much more expensive, professional scales can be used to verify. At first I did not know how to remove the sliding plastic cover and nothing in instructions say about removing cover..but I eventually figured I needed to use some force to slide it off. It works great and is accurate with no need for additional calibration. ''Great'' this one came with batteries as well as a pad to set it on so it doesnt slide. I would order from them again if i had to. Thanks you guys. Fairly accurate and portable for a cheap price. However, if you want to recalibrate it you have to buy the 300g weight seperately, which is where the cost comes into play. Super disappointed. I bought this scale based on all the great reviews. I used it only three times and it stopped working. Though the store told me the product was likely defective, my store warranty has passed and my only option is to return it to the company but by the time I do that, it will cost me more money in postage. More time in hassles. At least it wasn't expensive. 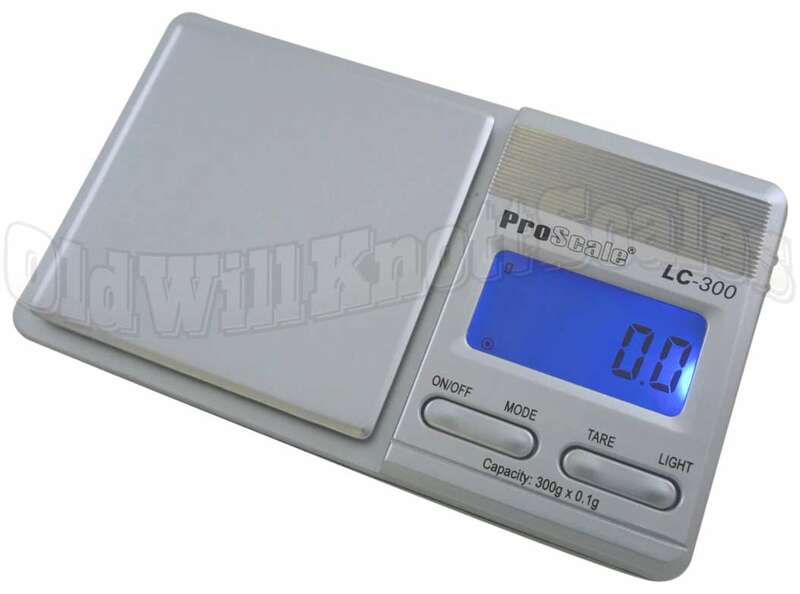 I purchased a 300 gram pro scale pocket scale and I can't figure out how to calibrate it. Please help! Excellent product, extremely useful, pharmaceutical precision, in a word awesome. Everything described in Product Description is accurate. Thank you and congratulations Old Will! Don't let the size fool you. This pocket scale is perfect for weighing meat and other proteins as I learn to control my portions. I love the size as it even fits in the smallest of purses. I like how you can use the cover as a tray. If you turn it on with the tray setting on it, it automatically adjusts to zero so you are weighing ONLY the material you want to weigh and don't have to deduct the weight of the tray. I may get another one to keep in my bag for travel. Great value. Also arrived very quickly and well packed, exactly as described. This scale is perfect for us. We are going to sell some things at the antique mall and wanted to be sure what our jewelry weighed so we could price it and also we want to sell some as scrap and wanted to know how much have so we don't get taken. Great little scale you can put it in your shirt pocket and go. I weighed some gold before selling it and it matched the jewelers more expensive scale. I like it came with the anti vibe mat and I received it in 3 days. Nice little unit for the money-I also purchased the LC50. Great service, too! Great Product. Great Price. Great Website. Great Service. Thank you Old Wills. I will certainly be back for my scale and accessory needs. A perfectly good product, especially considering the price. Nice that it came with batteries, ready to use. I found it it very eazy to place my my order, very sadisfied with this order. The price is A #1, The scales is A #1, and Old Will Scales is A #1 in my book!! Thankyou Bidpopsdewey From the hill country of Tx. This website has helped me a lot when it came to finding a great scale for a great price. Customer service was great and i really appreciated the "live chat" feature and all the help it provided. Ordered monday received thursday. My scale is exactly what i needed and I would not buy a scale anywhere else. I will definitely reccomend this site to all my boys. Thanks Old Will.. In order to calibrate the scale based on the manufacturer's requirements, you would need to use a 300 gram calibration weight. Using any other weight may void the warranty. Thanks! Can the L300 weigh letters and envelopes up to 9x11?